So after about a week of telling the guys in the office how bad Tesco's food was for lunch, and moaning that they always seems to want to go there, this news article popped up in the Metro newspaper today! 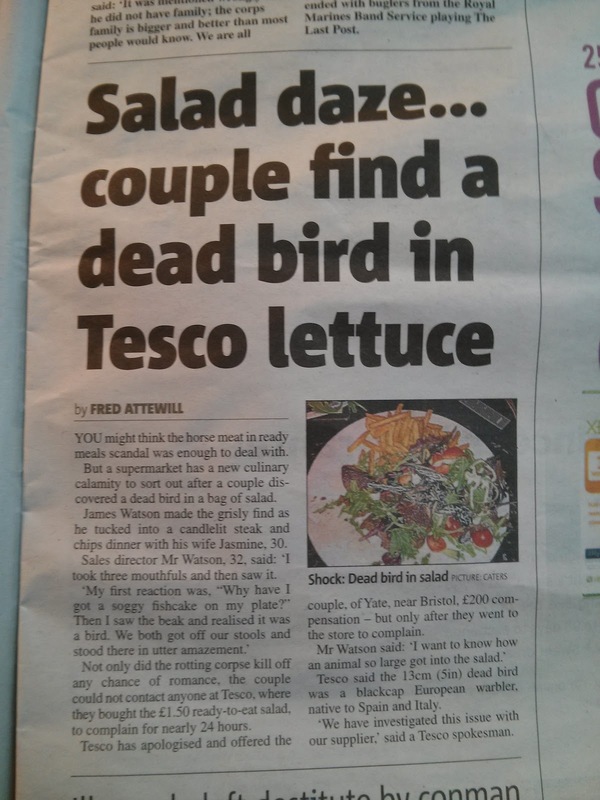 Some guy apparently found a Dead Bird in his Tesco salad! Not only that, but if the photo is to be believed he served the salad up on a plate with chips and started to eat it (taking two mouth fulls) before noticing the poor creature sat on his plate. There are a couple of points wrong with this article. Firstly, what kind of crazy dieting book had this guy been reading to think that eating salad with chips was a good idea?? 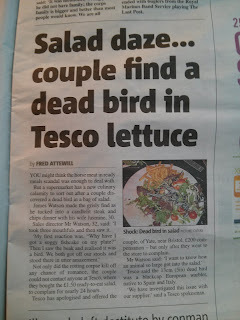 And secondly, how the hell did the guy not notice a dead bird falling out of the salad packet and onto his plate!!?? Did he think it was just a large, heavy chunk of lettuce?? did the feathers and a beak not give it away? ?